This is about nestling in… curling up. Snuggling. Given that I’m a “warm weather” girl – aka a “weather wimp” – it also means getting and staying warm and cozy. 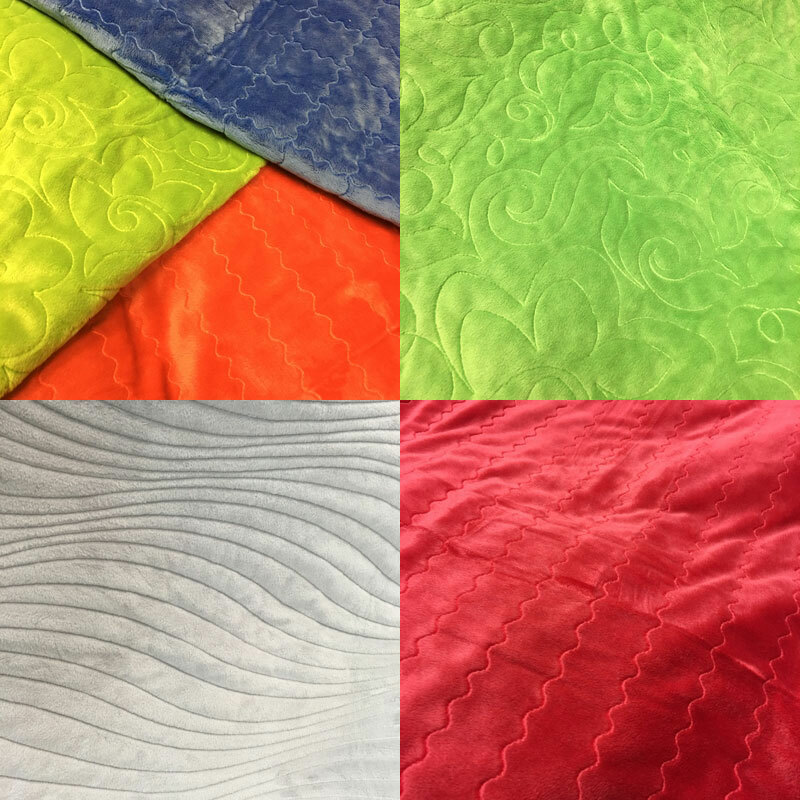 Quilts are wonderful for that, especially when they’re made to be extra “snuggle-y” with a plush, velvety backing. Have you quilted with Snuggles or Fireside? This is Fireside – it gets an additional finish that makes it a little softer, and gives it a texture a bit like a very soft towel. This is Snuggles. It feels very velvet-y and plush. Of course I had to ask 2,382 questions about it. What is it made of? 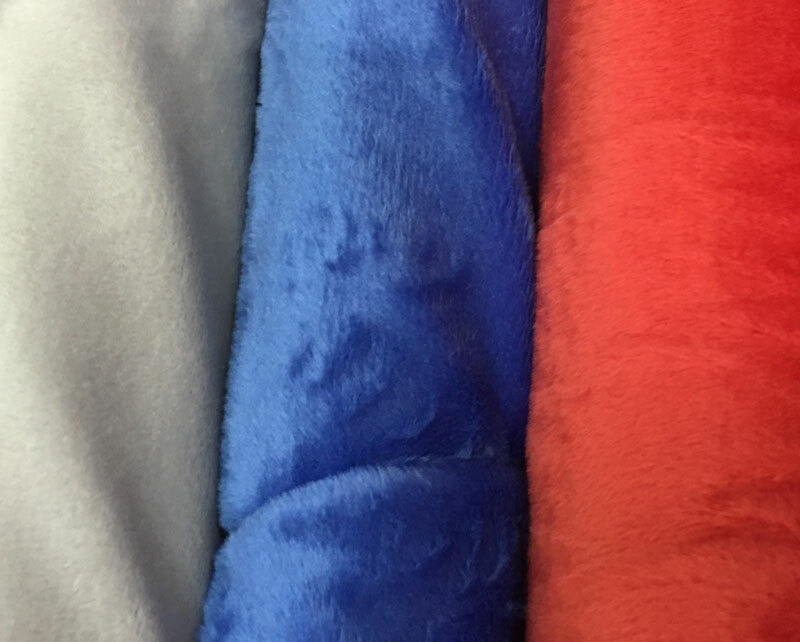 Both Snuggles and Fireside are 100% Polyester, making them safe for machine washing and drying. As fabrics, they’re described as “plush” or “plushies”. Do they need batting? No. It’s not required but some folks like the extra thickness and weight. It’s personal preference. But if you do choose to have a layer of batting, use a thin one. How difficult are the fabrics to quilt? For machine quilting on a home machine, the Snuggles and Fireside don’t need any special treatment. Baste the quilt layers as you normally would, then quilt as desired. Most quilters who have quilted on their home-machines with Snuggle or Fireside recommend starting with a new needle, using a 40 wt. thread – or thicker, and then cleaning the machine after you’re finished. Both the green and gray quilts were done on a long-arm machine using digitized designs. Some long-arm machine quilters love quilting with Snuggles and Fireside, others don’t. (And some won’t.) A few years ago, ModaLissa asked our uber-quilter Maggi Honeyman if there were any secrets or tips to quilting with Snuggles. Next – the fabric must be loaded on the cross-grain of the fabric – the stretchy cut side – and not on the selvages. The selvages would certainly be easier to pin but take it from experience, it doesn’t really work out so well! Also, it’s important to put the pins very close together so as not to stretch the fabric. Now that you have the quilt loaded, be sure not to put too much tension between the top and bottom rollers. Again, you do not want to stretch the fabric. After basting, clamp carefully and then quilt away. As for the colors available – there are plenty to choose from. 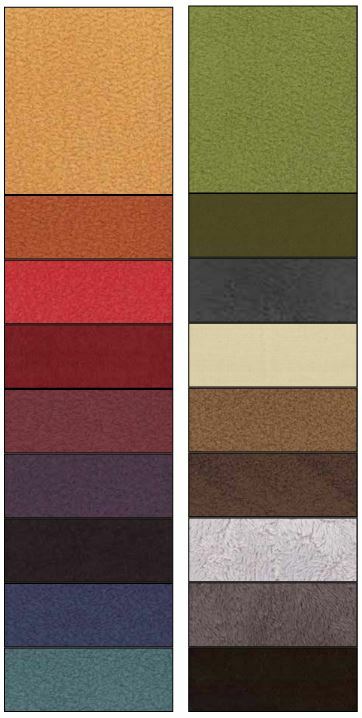 Fireside – a few of these colors look very much like “school colors”… just saying. 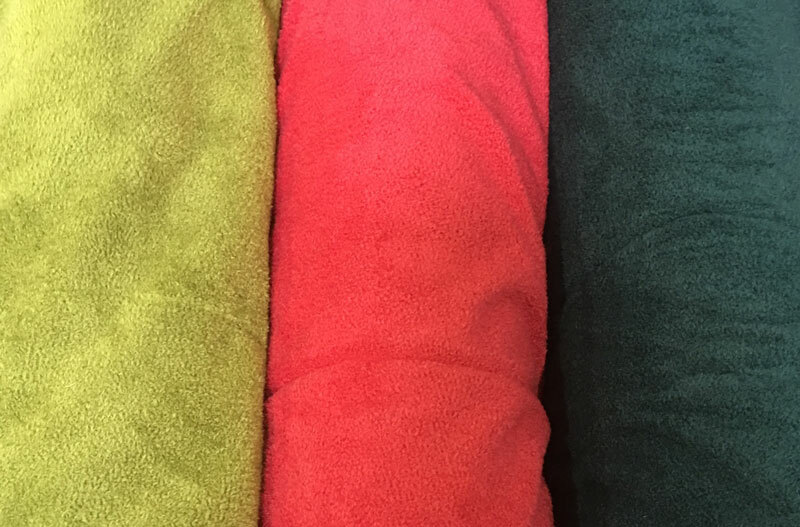 And Snuggles – why yes, I picked the fabrics for the front of my quilt based on the color I wanted to use on the back. You’re not surprised by that, are you? Yes, I’ll show you what I made when it’s finished – quilted, bound, washed, etc. So have you made a quilt backed with Snuggles, Fireside or a “plushie”? Any tips? Are you shocked that it’s taken me so long to “come around”? I have longarm quilted snuggles and fireside for YEARS, love it. I donate at least 10’quilts a year with it on the back. I design my quilts so I don’t have to piece the snuggles/fireside… Usually 58x 72… A really nice sized lap quilt. 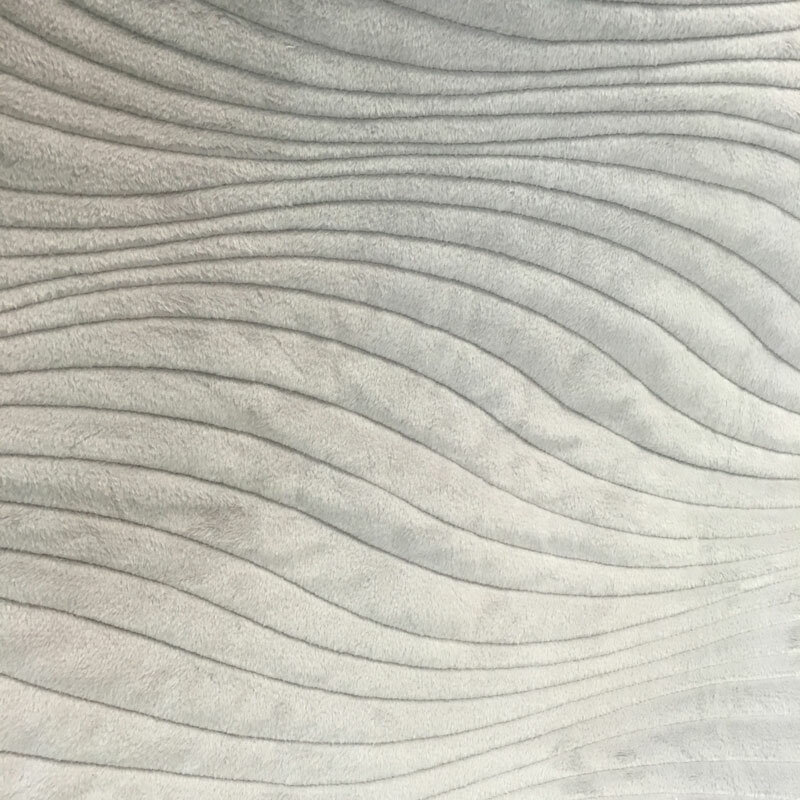 Thanks for the tips on quilting with this material – I’ve been recently wanting to try it for backing. Very informative. I’ll even give it a try on a baby quilt size. Thank you Carrie for the inspiration. Just finished a quilt that my 10 yr old granddaughter made with snuggles and I agree with Maggi’s instructions for loading on a longarm. The top got a little puckered in places but my first one so more practice needed. My granddaughter was thrilled and helped throughout the process. How timely, I just was gifted a quilt with this on the back, and I love it! How toasty I am going to be .I will give this a try for future projects. Thanks so much for all the info! I’ve never tried these as a backing before and so I have a question: do you prewash the fabrics? I never prewash my cotton fabrics but I’m not sure about this because it’s 100% polyester. The one quilt I had quilted without batting and Minkee on the back, the threads all came through to the front of the quilt. It was for a young boy, so really didn’t matter, but I would recommend using some sort of batting. But this new stuff might be better for quilting than Minkee was. I had no idea there were this many colors out! I wonder who carries these fabrics. I have seen similar at JoAnns but they don’t call it this brand. I’m now going to look online. I would really like a quilt with this backing. Thank you for all your posts. I always learn something! I’ve not used the Moda plush fabrics as I can’t FIND them! 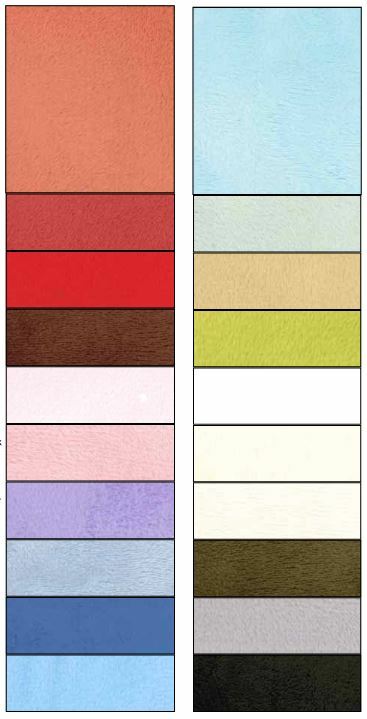 I’d love to know of an online source with lots of the colors to choose from.